Simply put, Nightingale took the traditional housing developer model and cut away anything they deemed to be unnecessary, introduced high standards for sustainability, and gave the ownership of the project to the only ones that made sense: the buyers, the ones that will live there. Earlier this year, I was fortunate enough to score a ticket to Nightingale’s sold-out information meeting on their upcoming project in Australia. It was a standing-only ticket, and when I arrived, it quickly became apparent why: the 500-seat lecture theater at the Melbourne School of Design was packed to the brim, with late-commers resorting to the stairs and banisters. We were all here to hear more about Nightingale’s latest project (and soon up for sale), the Nightingale Village – 7 apartment buildings, with 7 architects, in the middle of Brunswick, one of the trendy inner suburbs of Melbourne. The popularity of this event shouldn’t surprise anyone that has prior knowledge of Nightingale. The small but ambitious team is behind some of the best housing projects in Australia, with awards to show for it. These housing projects are being delivered in a housing market that has become more and more unaffordable and unequal. While prices are going up, home ownership rates are going down, and all of this is happening simultaneous to an explosive population growth expected over the next decades. And it’s with these developments in the back of their minds that Jeremy McLeod and his team stopped and started reflecting on the projects they were doing as architects. “We found ourselves working for property developers and being directed by project managers to deliver, what they would refer to as, a product for profit. And the quality of housing that was delivered through that model was questionable at best,”Jeremy explained, when I met up with him at the Nightingale studio a couple of months later. As any good revolution, it started with a manifesto. 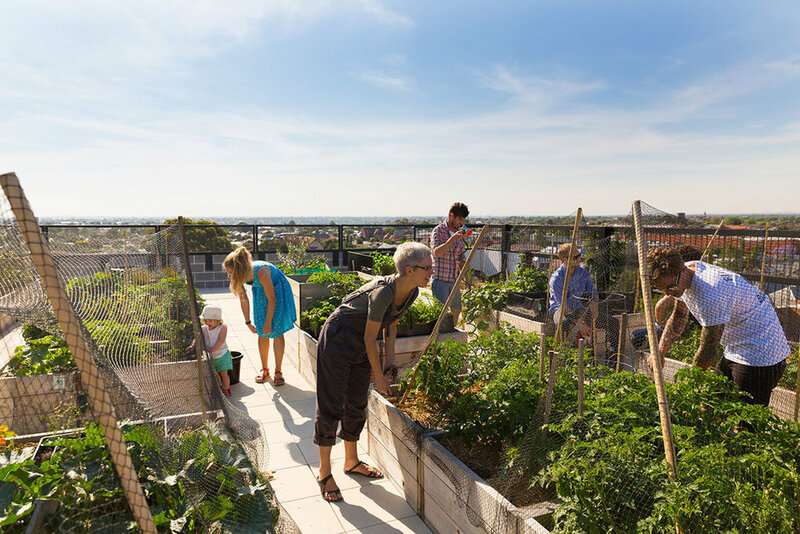 Jeremy and his team at Breathe Architecture had built the Commons, a progressive apartment building, with no car parking, high-quality apartments and plentiful communal areas. And it was a hit, winning them both awards and press. “The idea was that we would build this as a prototype to encourage our developer clients to see that if you build something that is sustainable, that does build community, that there is a market for that. Hoping to just change the development sector enough, so that we could then go and continue to work as architects; you know, to do what we are good at. Jeremy and his team realized that the only way to change anything was to take control over the financial part; to develop the projects themselves. However, they couldn’t do that alone. With help from academics and tax experts, they developed a financial model, which was then translated into a manifesto. “I took four days out of work to write a manifesto on the state of housing in our city, and sent a call-to-arms to about 30 of the greatest architects in Melbourne. This is what I proposed to do: I wanted to buy another site and I wanted another project like the Commons. We wanted to fund it totally independent of any bank finance, we wanted to make sure that was triple bottom line and we wanted to show that it’s replicable. When the Nightingale project started, all they had was a waiting list of 11 people, mostly of people writing to them after they finished the Commons. After the call-to-arms and with no marketing budget at all, the first information meeting drew over 125 people. There was clearly a demand. They quickly realized the 20 apartments included in the first Nightingale project wouldn’t keep up with demand, so they asked one of the firms that had responded, Six Degrees Architects, to start looking for a site for Nightingale 2. By the time the waiting list reached 700, Austin Maynard Architects had started working on Nightingale 3. So, what is it that makes Nightingale so special, so sought-after and admired? With the Australian housing market in crisis, the Nightingale Housing model is taking the traditional developer model and hacking it. There is no marketing, no real estate agent, no hidden profit margin; it is delivered at cost, meaning that what you see, is what you pay for. And what you get is of high quality and sustainable. Nobody can accuse the Nightingale team for lacking ambition, and with their first project constructed, sold and occupied, I was curious to hear if Jeremy felt he had succeeded, especially the social sustainability, which can be the hardest to measure. “We have anecdotal evidence from people after they’ve moved into the Commons. They’ve sold their car, they’ve lost weight, they seem happier, they seem less anxious, they seem more connected, you know. I could cite you a ton of individual examples of how that’s happened. “With Nightingale, we’ve partnered with RMIT to do a longitudinal study of the Nightingale 1 residents, asking all of those questions. They interviewed everyone before they moved into their apartments, and then they’re going to follow their progress over the next five years. When it comes to the more environmental aspect of the project, it is easier to measure. Energy consumption is about 25% of any building in the area, and carbon emissions are minimal, thanks to green sources for electricity and heating. The Nightingale 1 is also fitted with 200 sensors, installed by a PhD student, measuring temperatures and air quality, both internal and external, which are then compared to energy usage. “Yeah absolutely, and again open and transparent,” answers Jeremy, when I ask him if you could say they use a trial and measure approach to their triple-bottom line.“So, if something doesn’t work, we just say “okay, that is a failure” and then have to find out what we need to do to adjust, to make it better. That’s the idea, and I mean if you guys want to send a crew out to count some people for us that would be awesome,” Jeremy laughs. With 22 licenses granted across the country, one is handed over, a few are under construction, and several more are in planning phases, including the Nightingale Village. What the little team in Brunswick do most days, is all about helping the architects with site feasibility studies, land acquisition, financing and planning processes. And – because they themselves are developing the projects – they are also holding information meetings for potential buyers, and balloting nights, where the lucky ones are selected. “We know that humans can remember about 150 people and consider them friends. So, limiting the number of apartments to 40 units per building, is again based on the idea that you might want to have about 75 people living in each building. This way they can be part of a broader community, or a part of a broader village. At least that’s the assumption we are making, and we’re happy to take feedback and comments on this.